It feels like that 2011 flew by us too quick. Not much has changed in our household. DH is still busy with his work as usual, I still (try to) keep the house organized, make sure that everybody's fed and demand my kids to do whatever they're suppose to do by instilling fears into their little heads (like that EVER works!). Although on the other hand, I must say that 2011 was the year for growing. By that I mean that the children are growing up, DH and I are growing out. Big C is almost 13 years old has grown to be as tall as his Dad and 9 year old little C has outgrown most of his clothes. But, changes in body size aside, we went through the holiday break pretty much unscathed. Quiet Christmas at home, several play dates and sleepovers (for the kids and their friends), ski trip, Six Flags day and New Year's Eve dinner with family friends. That kept us busy enough. So it's suffice to say that I'm looking forward to a better, peaceful and happy year to come. 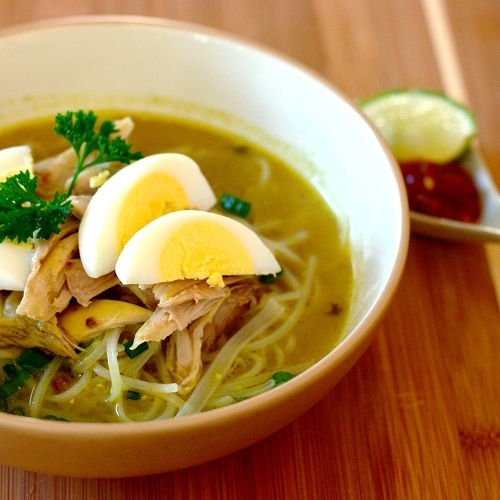 To mark the beginning of the year, and to stray away a little bit from greasy and heavy holiday food, here is the recipe for Soto Ayam Ambengan (East Javanese Chicken Noodle Soup) that's perfect for a chilly winter night. It's fragrant, because it contains a lot of lemon grass and kaffir lime leaves, yet succulent and rich. In a large pot, put together water/chicken stock, chicken, lemongrass, lime leaves, sugar and salt. Bring to boil and reduce the heat to medium. Continue cooking until the chicken is cooked thoroughly. Remove chicken from the pot, cool down and shred the meat. Put aside. Using mortar and pestle, grind the first 9 ingredients until it forms smooth paste (or use food processor). Stir fry the paste in hot oil until fragrant, then transfer to the pot with the stock. Cook over medium heat for about 15-20 minutes, season with salt and pepper. To serve, separate noodles into bowls, top with shredded chicken, chopped green onion, celery and hard boiled egg. Ladle hot soup over the noodle. Serve with lime juice, kecap manis, chili sauce and poyah if desired.